Wind: Typically light from the SE early, moving WNW to northerly, one gust of 15 MPH. 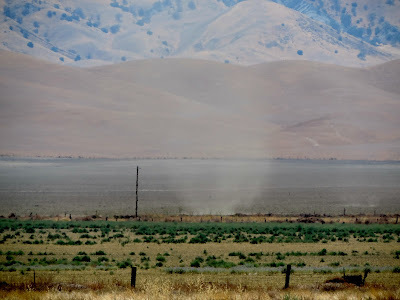 At first the day looked to be so-so with few dust devils in evidence. But as the day wore on the dust devils began popping up all over the low foothills. 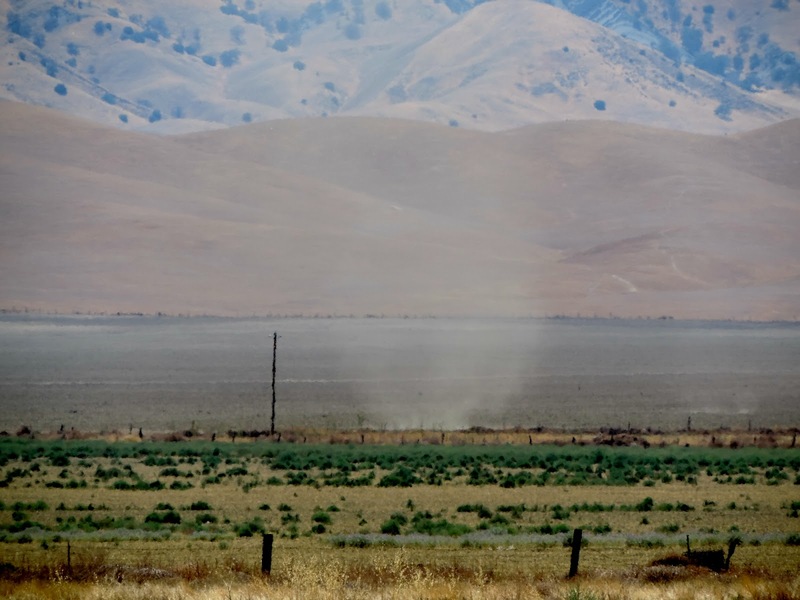 A nice big dust devil just to the west of the field promised good lift above it. More of the same good markers for those circling nearby. And they kept getting bigger and fatter as the afternoon got later. The flying day started off slow. 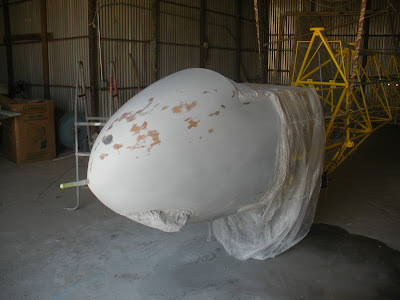 However, in the work hangar things were going full tilt sanding the nosebowl of Orange Crush. Skip Briedbach, Frank Owen, Larry Johnson, Sergio Grajeda, and Jan Zanutto were busy at work. If this nose cone gets any smoother it will morph into a mirror. Roman Franco with mentor Harold were the first ones up. One of the planned activities was a practice rope break @200', but even switching to runway 13 for a little bit of a headwind did not counteract the mid-80s temperature and maybe less than optimal towpilot technique. 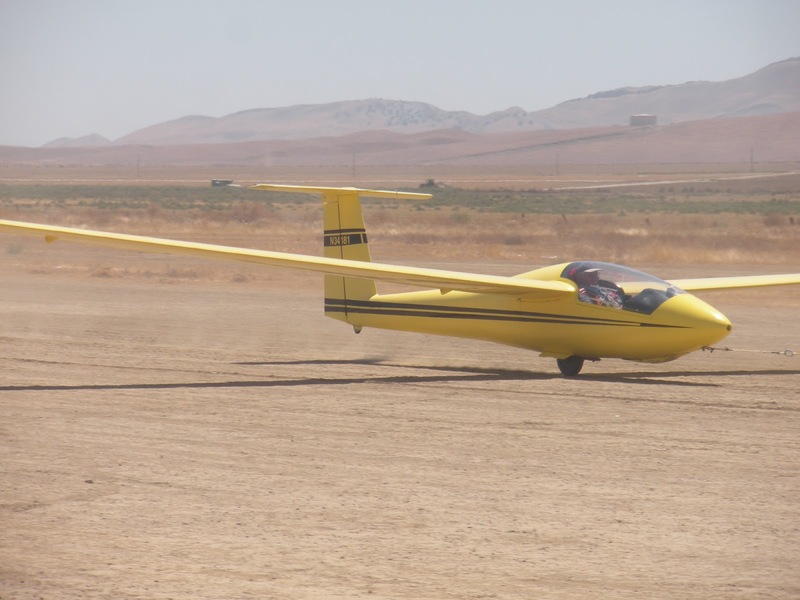 When 200' was reached, Harold thought it may be too far away for an assured landing on the gliderport. 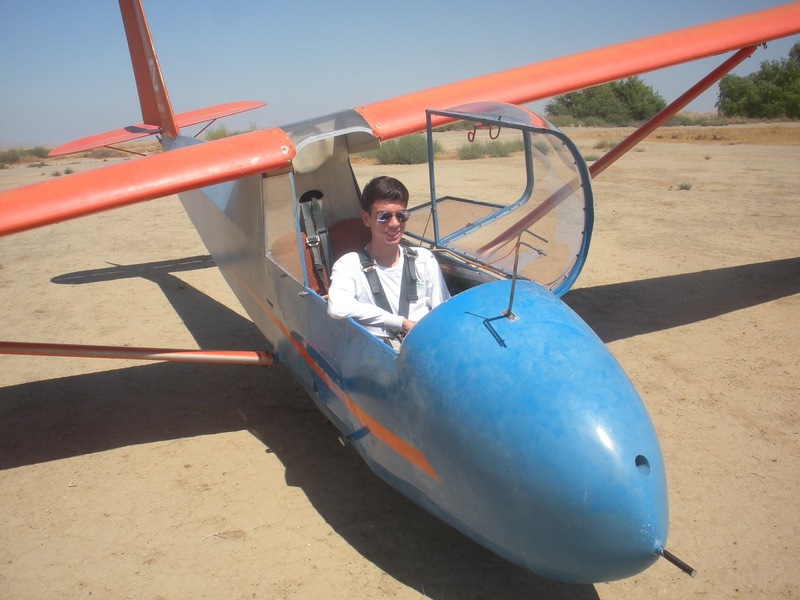 Roman Franco ready for his second flight which was greatly improved from the first. 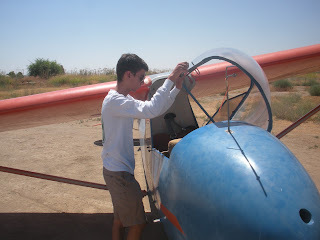 Roman closing up the glider after two good training flights. Morgan and Julie showed up with a new addition, a Brown Lab called Lizzie that was pretty well behaved already. Sergio Grajeda and Alex Caldwell were up next before lunch. 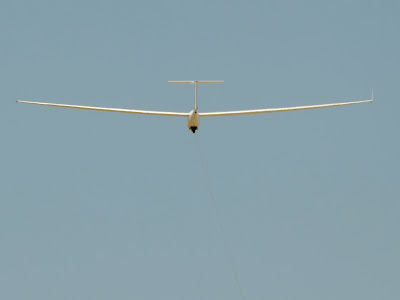 They also finished off the day with a longer flight with some thermalling. 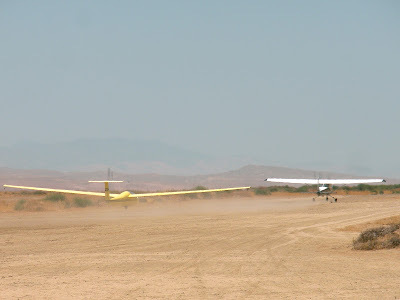 Sergio Grajeda and Alex Caldwell launch on what turned out to be a nice long thermalling flight. 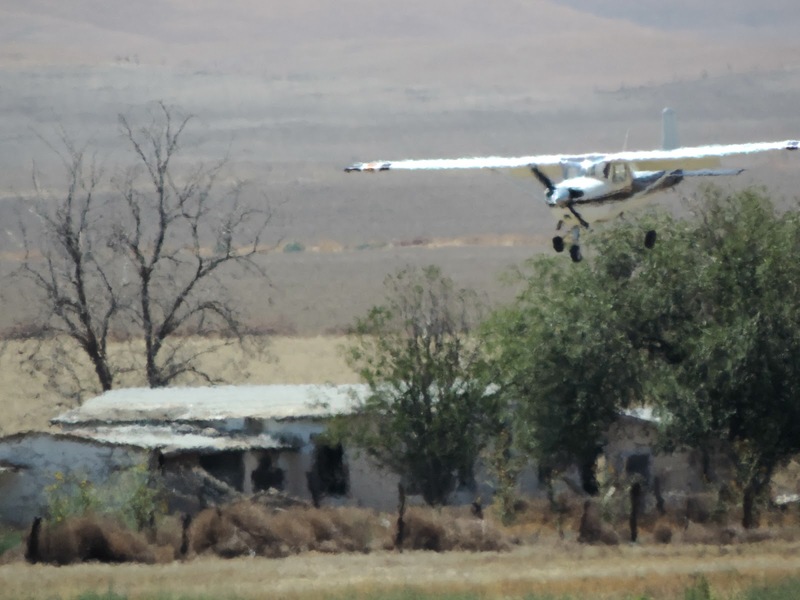 Burgers were BBQed during a lull in the action, then it was time to get back in the air. 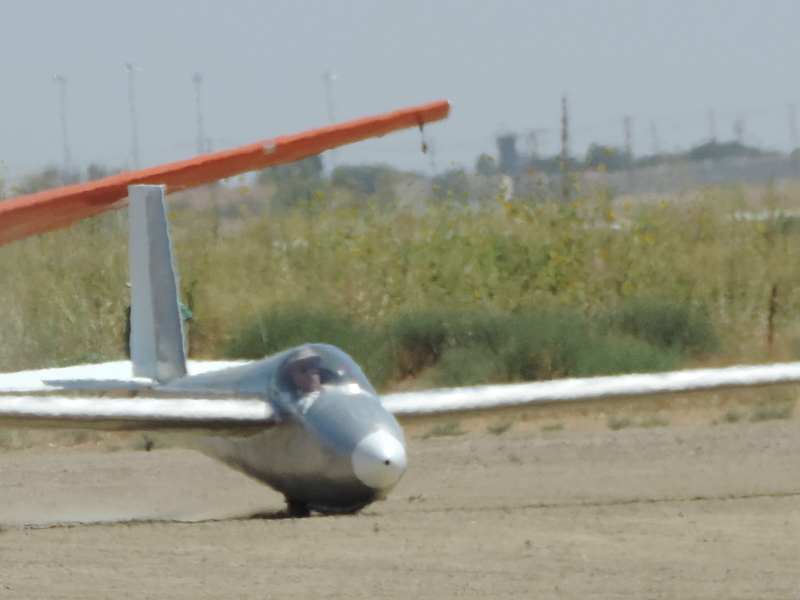 Richard Walker took a quick "warm-up" flight, then got a another tow and stayed up for the remainder of the afternoon. Richard Walker on his first launch testing the thermals before committing to a longer flight. 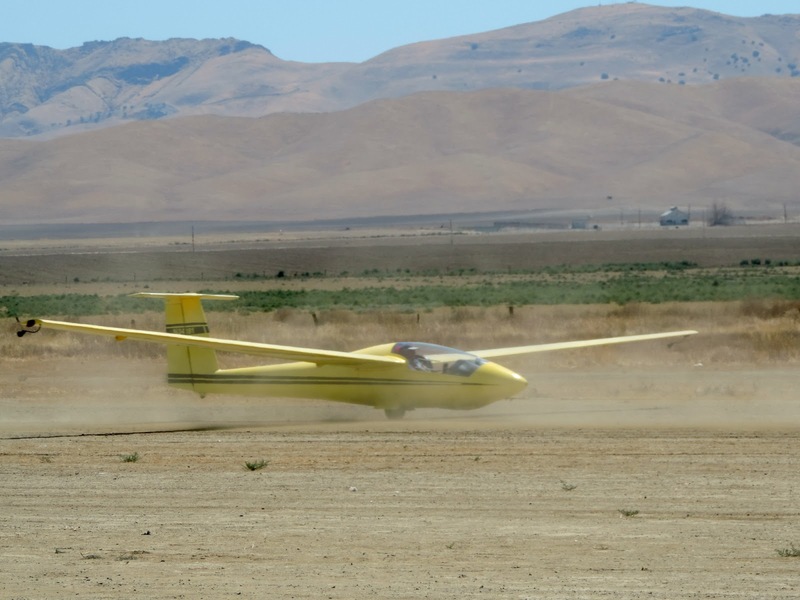 Richard Walker in great position behind Frank Owen in the tow plane. Richard is back again for a much longer flight this time. Richard's second launch into a much better field of thermals and dust devils. 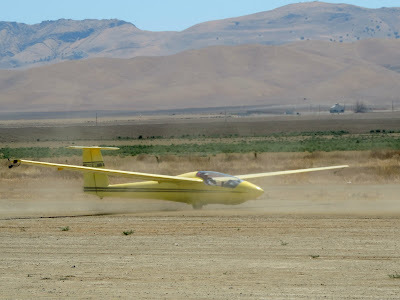 Frank Owen returning to runway 7 after dropping off Richard Walker west of the field. 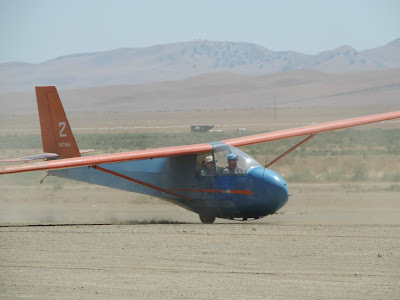 Alex Caldwell did one demo flight before he went up with Sergio Grajeda the second time. Morgan decided to fly Julie's new sailplane for the first time. 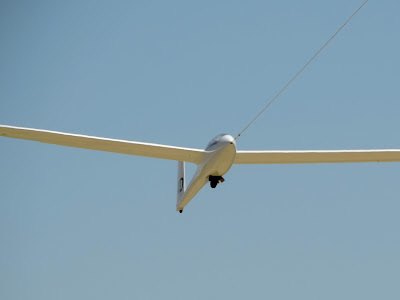 She's had the glider for awhile but he's not had a chance to fly it before today. Julie Butler in front of her Discus that Morgan is about to board and launch. Morgan Hall ready to launch with Sergio running his left wing. The heat ripples make this a painting. Launching on runway 31 they will be quite high over the fence. Morgan piloting the Discus towards an ultimate landout south of Avenal. 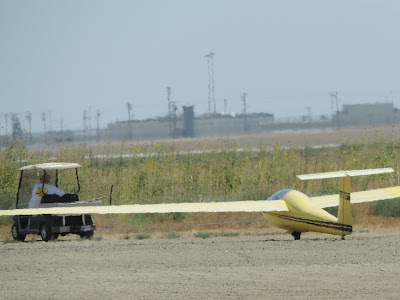 On tow past the fence and heading aloft for a long flight and a short return. 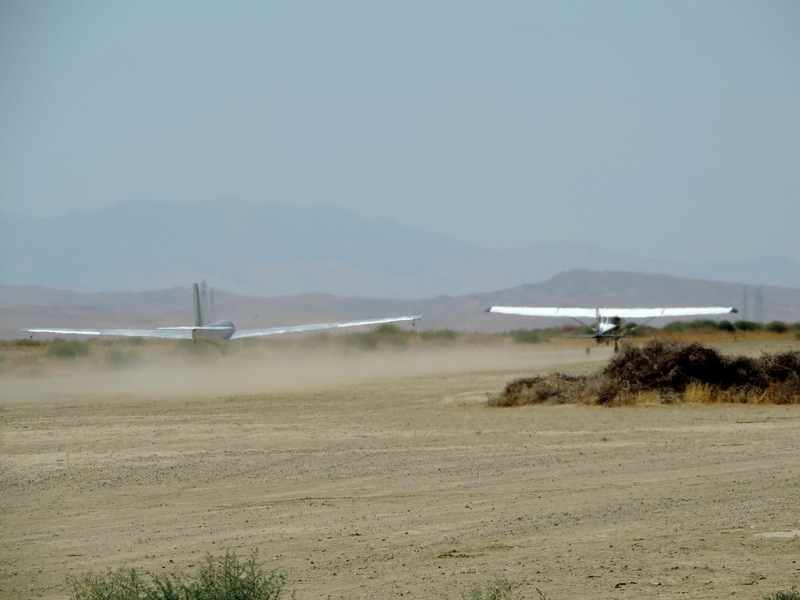 After a late attempt to fly to San Luis Obispo from Avenal, the marine push was too far to the east and it wasn't going to happen. Paso was unreachable with 15kts of headwind. 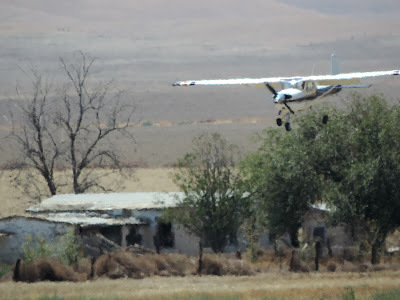 I could have dove back towards Avenal and probably got up, but would definitely have had to commit to a field landing. 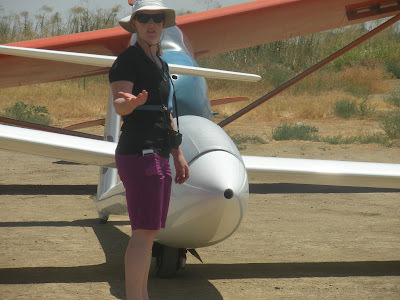 As it was my first flight in Julie's Discus, I felt that was rude. So I worked my way back to Shandon and a strip I drive by every time we go to Avenal. It is in good shape, no cattle, fences or weeds. 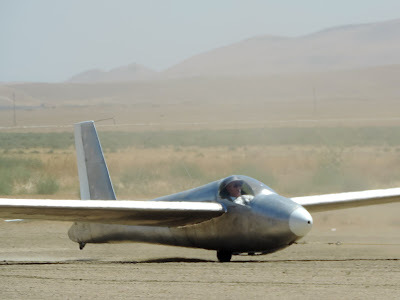 Completely safe landing, just have to come in high over the trees and power poles on the east end of the strip. And a huge combine parked next to the runway. Julie was there when I landed and we packed up in about 20 minutes and were ready to go. 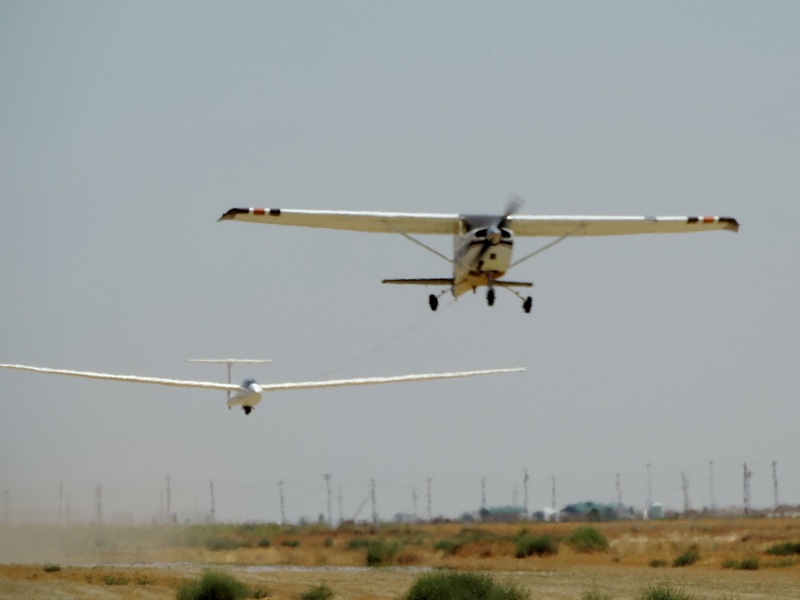 I released at 1100' AGL because I had gotten both well above the towplane and had a very slack rope. ...no use in jerking the towplane around. Was within gliding distance and in a booming thermal. The thermal seemed to be doing it best to convince me to leave, but I tood my ground until I left on my terms. Headed for the hills to the west. Enroute is was smooth all the way. At 3:30 the east facing slopes would not be getting much solar heat, so when I started getting below the ridge line, I felt there was no point in going any further, so retreated back to the angry thermal. After getting altitude again, went for the Kettlemen Hills, which had a good lift report a couple of hours earlier. Not quite smooth, but the bumps were mostly small enough that I did not try to work them. The two bumps that seemed promising only let me maintain altitude. Got to the crest of the Kettlemen Hills, and even though had altitude to spare, did not see the point in going any further east. Coming back to the Avenal Valley I joined Alex in a thermal for a couple of turns, then left so he could concentrate on the demo flight he was giving. While I had great view of him, the structure of the 2-33 would be impeding his view of me. 5:00 pm must have been quitting time for the thermals, as they quickly stopped working. 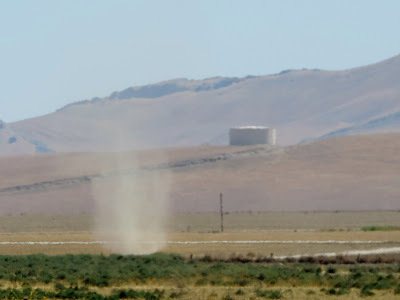 I saw one dust devil working overtime near the northeast corner of the circle crop and went for it. 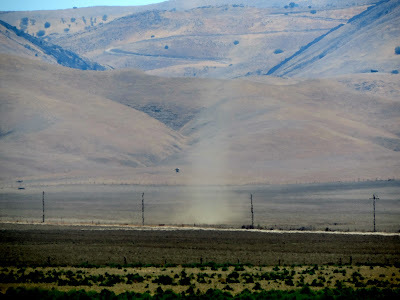 There was a lot of lift in the "hot spots" over the nearby freshly plowed bare fields. Many times the thermals today seemed to be trying to get rid of me. Several times full controls into the turn were not enough to keep the thermal from rolling me out of the turn. Once it even felt like I had been rammed from 6:00 o'clock low, and about three times my head gently hit the canopy. (The thermals did get my stomach to say, "let's take it easy a while."). 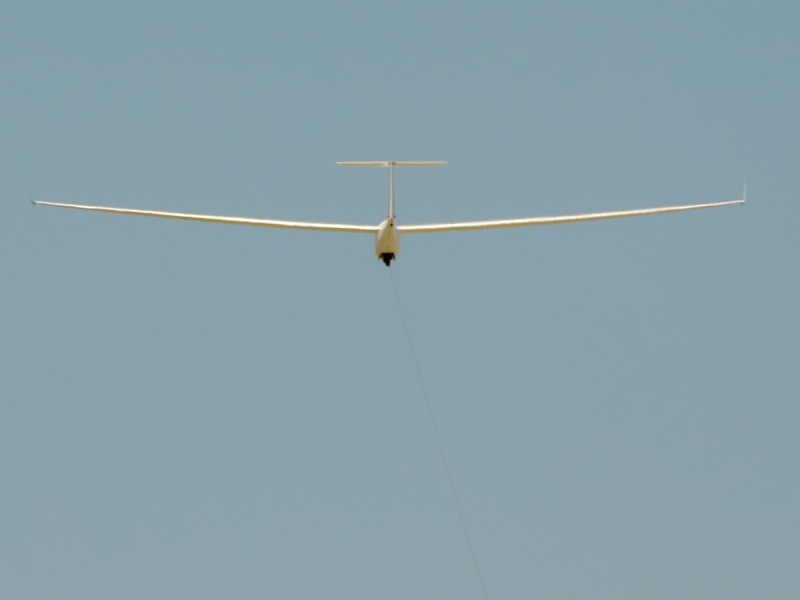 Probably never got more than 5 miles from the glider port, never got particularly high at a peak of only 6700', but did stay up for 3 hours. 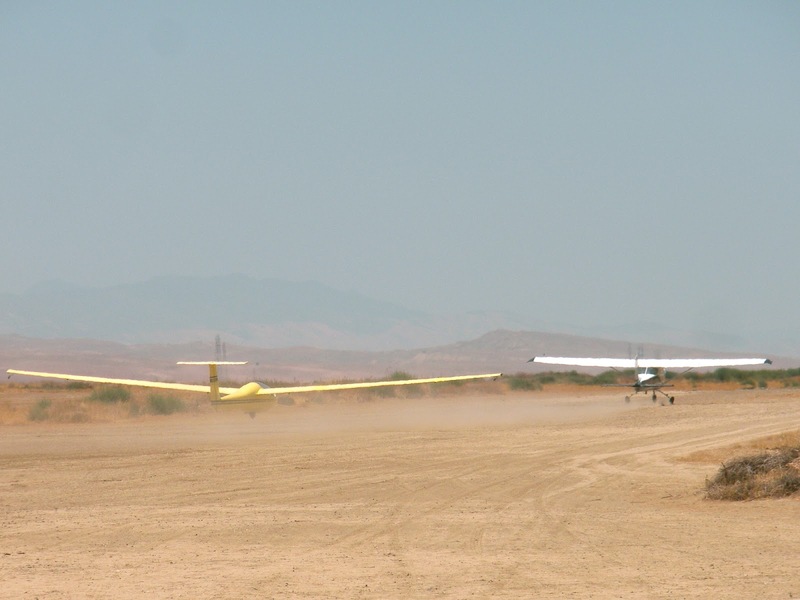 Jim Rickey and Sergio Grajeda moving the 1-26 out to the launch area. Jim Rickey is going over last minute preflight checklists while Sergio waits on his right wing. 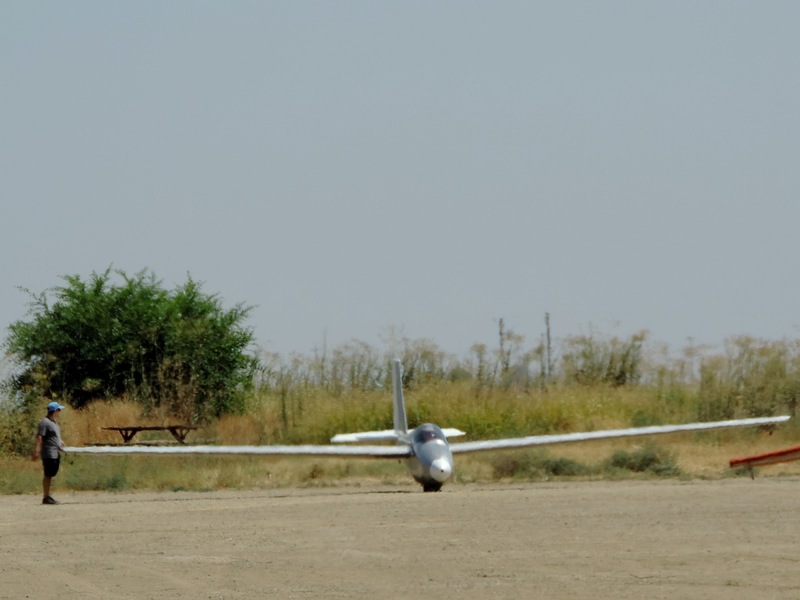 Jim is starting his launch sequence on a flight that lasted 3 hours. 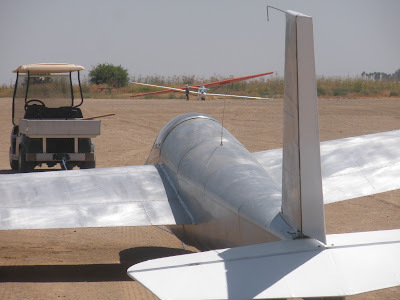 Good position behind the tow plane with the tail already raised. 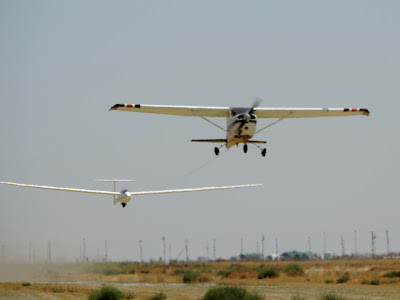 Nice and low behind the tow plane until the towing aircraft breaks free of the runway. 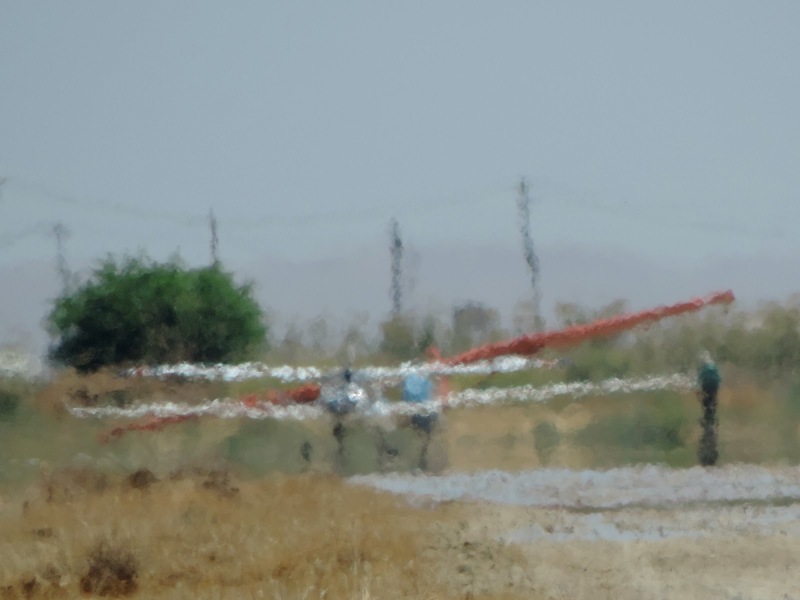 We hope to see more of our pilots next weekend. This is the time to get those personal bests both in altitude, duration, and distance away from the field. And of course, it's fun.